25 years and eight albums in, Hanzel und Gretyl continues to weave nightmarish tales of the black forest; expect no happy fairy tale endings as Vas Kallas and Kaizer Von Loopy speak now with ReGen. For 25 years, the New York duo of Hanzel und Gretyl has eschewed virtually all musical conventions to weave a wholly singular and nightmarish fairy tale of its own. 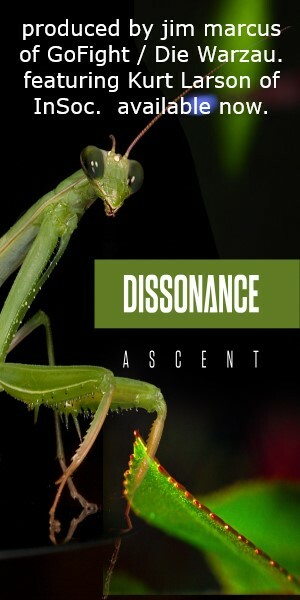 With the band’s juxtaposition of Teutonic programmed rhythms and martial riffs, topped off by an amalgam of German and English lyrics, Vas Kallas and Kaizer Von Loopy have stood on the fringes of electronic and heavy metal, creating a sound that is often categorized as industrial/metal, but in many cases defies even that most inadequate of terms. It’s not uncommon for the band to blend in touches of Wagnerian operatic pomp and searing techno backdrops, marking a satirical and surreal musical territory that has now brought the band full circle to what is referred to as the “Grimm Shiza” era – incorporating darker, more black metal influences and taking greater inspiration from the morbid tales of the Brothers Grimm, Hanzel und Gretyl released its eighth album in 2018, Satanik Germanik, which may be the band’s bleakest and heaviest album to date. ReGen Magazine had the opportunity to speak with Vas Kallas and Kaizer Von Loopy about this latest stage in the band’s musical evolution after 25 years, touching on the themes of the black forest, touring, an aversion to politics, and what the future yet holds for HuG! 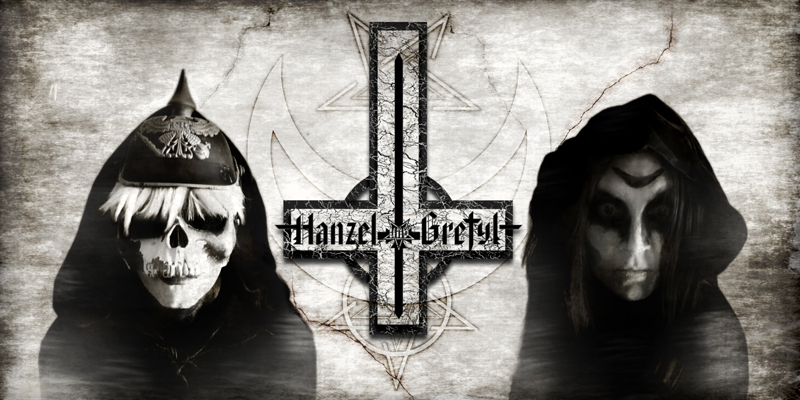 This year not only marks the release of Hanzel und Gretyl’s eighth full-length album, but also the band’s 25th anniversary. Reflecting on the band’s history, what are your thoughts on your development over the years? How do you feel your process has evolved, not just over the course of your career, but even between this current album and the last? In what ways do you feel you’ve surpassed your original goals for the band? Conversely, what do you feel you’ve yet to achieve? Kallas: There’s a lot to think about when you look at the number of 25 years. It’s a long time and a lot has happened! We can turn it into a binge watching Netflix series! But I have to say we still remain this unique ever evolving band; always kind of difficult to categorize. Even though we strive really hard to fit in, we’ve always remained on the fringe of the fringiest. Our process has always been the same since the beginning – do it yourself. Machines = Good. People = Bad. Follow your own path. On that note, our process of recording has evolved as well. We do not meet up as much in person during the recording process and rely heavily on sending tracks and recordings to each other instead. 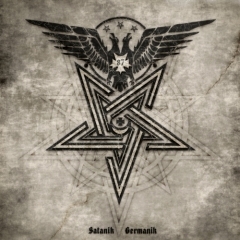 This worked well for Satanik Germanik! To further answer your questions… have we surpassed our original goals? I feel as if we’ve still never reached our biggest goals. I believe this is why we continue to do this. We keep striving to reach more people as it gets more difficult. But we are super grateful for the steady loyal über fans that have stuck with us all these years! Still, also to achieve is being part of the European festival circuit, which has been an enigma to us. But I trust that it can still happen! Von Loopy: We always took things as they came with the intent to always be recording and touring and hopefully carving out some kind of living while we’re at it! Anything beyond that to me is serendipitous! I have yet to surpass my goal of hosing down the audience with beer and crushed ice while being bombarded by bratwurst cannons… as I robot onstage with a chorus line of überfraus in latex dirndls! Satanik Germanik continues along the ‘Grimm Shiza’ style that the band began with Black Forest Metal. First of all, can you tell us more about how you came into this era? What motivated the shift towards heavier metal and the Brothers Grimm aesthetic? Kallas: Well, we were always in the Black Forest realm, since our beginnings because our band is named after the infamous Grimm fairy tale straight out of the SchwarzWald! We have a song on our second CD Transmission from Uranus from 1997 called ‘Black Forest Galaxy.’ We’ve always concentrated on this theme, but really finally hitting it hard now since the timing feels right. We have always considered ourselves to be a metal band at heart with a darker, stranger edge – at least, I have… only speaking for myself – but since we use tracks and programmed drums, we are categorized as industrial/metal. But actually… we are Black Forest Metal!!! Von Loopy: The transition to a darker, more morbid play on the Hansel and Gretel fairy tale was a no-brainer! And the black metal aesthetic and sound fit perfectly for what we were now envisioning for the band’s current direction. If you actually read the fairy tale, it’s pretty fukken black metal!! More music today seems to utilize technology and incorporate elements of ‘industrial’ production, such that they’ve become standard. What are your thoughts on the validity of the term ‘industrial/metal,’ particularly as it pertains to Hanzel und Gretyl? Kallas: We have been labelled an industrial/metal band only because we could not find a drummer back in the early ’90s, and therefore relied on technology to do our first demo. We actually did not know much about what industrial was during those first days. We really only heard of Nine Inch Nails, MINISTRY, and that was it… oh yeah, KMFDM. But really, we just strived to be metal and fell into a creative bliss, which has led us here today. Von Loopy: When we started, I knew I liked Slayer and I liked Kraftwerk as these two bands to me represented the alpha and omega in their respective genres – metal and electronic. Like Vas mentioned, we didn’t really think we were industrial; we felt bands like Neubauten and other more experimental acts that actually employed objects like power tools, banging on car hoods and aluminum beer kegs were industrial. Consequently, we discovered if you were adding electronics to your metal or vice versa, you were now industrial. Okay. The band is no stranger to controversy, even though your music and image has always been with a sense of satire and whimsy. Although not overtly political, what are your thoughts on the current political climate? Particularly as it pertains to Hanzel und Gretyl’s music and image? Kallas: I am a firm believer that politics do not belong in music. We get enough of that chaos in our daily news feed. Music is an escape from reality. Lyrics are colors that paint a portrait – a landscape, which is the song, the art, the escape, the dream. Therefore, I will never discuss politics, anywhere, anyhow, for any reason. Von Loopy: I think the current political climate is positively surreal and so are we. You’ve toured quite extensively; from what you’ve observed, what aspect(s) of touring have become more difficult (both for you individually and in a broader sense)? Kallas: I simply love touring! I am a dirty road dog ready for any adventure! I am in bliss when wheels are turning underneath me, bringing me to faraway places on a daily basis. Touring is not difficult for me personally as long as I get enough sleep (’cause Mama Vas needs her beauty sleep)… oh, and I can sleep anywhere, even right before going onstage; I can nap right there in the dressing room with bands blaring loud onstage. But I have to say that I’d much rather tour in Europe than the U.S.A. – reason being that in Europe, the headliner goes on at 9:30pm at the latest. The show is over and packed up by midnight. Therefore, more people show up on a weeknight because the night is early! SO SMART! Back in the good U.S.A., the promoters don’t put you on until midnight – people leave, the band does not finish and get to rest ’til 5:00am. It’s a nightmare. No sleep and the drives are very long. Von Loopy: One’s approach to touring will change after enough trial and error. What you learn hopefully is how to avoid getting sick, losing large sums of money and your iPhone charger, and overpacking your suitcase. One thing that we are adamant about after so many years of touring is getting awesome hotels. We probably make more of an effort these days to arrange for time off in certain places to enjoy the local culture. 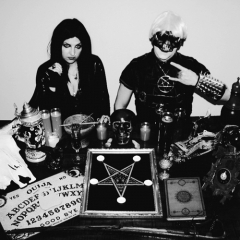 Kallas: We’re beginning to think about the next musical creation for HUG – new music and releasing more merch specials, the Satanik Germanik demo tape, and other interesting products. We also hope that we are able to tour in 2019 as well. Von Loopy: We are taking the time to refine and perhaps upgrade our live show experience. We haven’t had the time or space to really focus on how we would prefer to deliver a performance at the level we feel fully capable of doing because we have been in a perpetual state of recording CDs then touring extensively. We have chosen this time to address this and look forward to getting back out with a laser-like vengeance in 2019!